Me and Paula hanging out in her gift shop in historic Savannah, Georgia. I’ve never met Paula Deen, but this I know: She is not a racist. I write this post on the heels of yesterday’s breaking news–that Food Network will not be renewing her contract. Like many of her fans, I too am from the South, her native state of Georgia. We share a love for Southern comfort food, seafood and the coast. For years, I’ve cooked from her cookbooks, eaten at Savannah’s The Lady and Sons, visited her gift shop and looked forward to Saturday mornings when I could sit down and learn from her as I watched Food Network. I’ve spent many an hour in the kitchen following her recipes and laughing with my Grandma over how long it took me to bake her lemon cake, and how easy they made it look on TV. I can’t count the number of times I’ve eaten a delicious cake or herb-roasted pork tenderloin with the family, and upon that first bite of pleasure uttered the words, “It’s a Paula Deen recipe,” as everyone tasted in agreement. I’ve read her book It Ain’t All About the Cooking and have found myself in her as I admired her rags-to-riches story. I’ve tasted some of the best food I’ve ever put in my mouth from Paula Deen’s Southern Cooking Bible. Paula Deen is a nationwide household name. As fans, we feel a connection to her, relate to her and associate good memories with her food and her name. Just this week before the news was revealed, I made known my ambitions to cook with Paula on her Best Dishes Food Network show. She has been a huge inspiration for me in the kitchen and without her, I wouldn’t be the cook I am today. 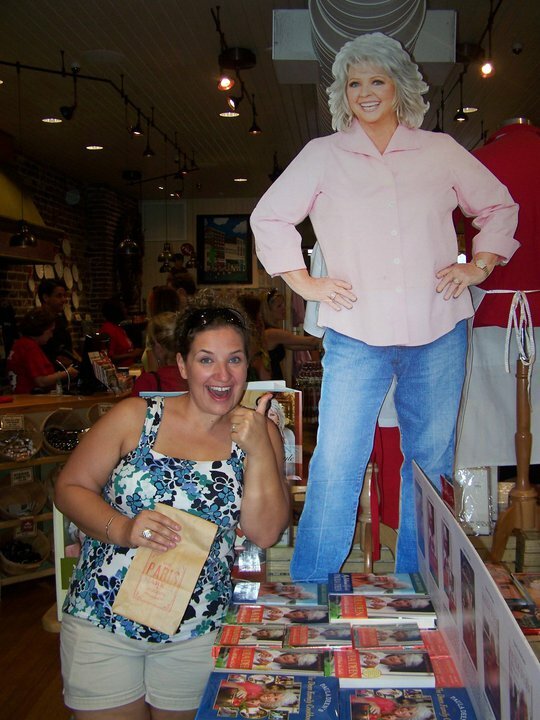 Paula paved the way for many Southern TV food personalities that have come and are coming after her. For that, I’m thankful. Paula, Michael, Jamie and Bobby…if any of you read this, know that this morning we sit around our breakfast tables saddened. We’re wondering how this will affect Jamie and Bobby’s Food Network shows, how we’ll ever be able to watch the network again without hearing Paula’s laugh and seeing her familiar, friendly face. No matter what lies ahead, we love you all and will always be fans. Know that our thoughts and prayers go out to your family. Paula Deen is not a racist, and that’s just the truth y’all. None of the things you mentioned––”We share a love for Southern comfort food”, “I’ve spent many an hour in the kitchen following her recipes”, etc.––have the least little thing to do with whether or not she’s a racist. Here’s what might have something to do with it: the fact that she admits to using the “N” word, and then says, “Things have changed a lot in the South since the ’60s”, implying she doesn’t use the word anymore. As a Southerner, that insults me, and it’s nothing but an excuse. I guarantee you not every Southerner used that word in the ’60s. The civil rights war was raging in those days. Which side was Paula Deen on? Thank you for reading my post and for commenting. I understand where you’re coming from. The examples I used are intended to show my good belief in Paula Deen’s character. I respect that she admitted to using the “N-word” and chose to apologize rather than lie. I don’t believe for one second that Paula Deen is a racist, and those she employs in her restaurant and the guests she’s had on her Food Network show, for many years, are evidence of that. Fair enough. Thanks for the level headed reply. I like your site very much! I have met Paula. My husband moved to Savannah in 2000. Before we were married, visited him often there and then moved to Savannah. Paula brought “Gooey Butter Cake” to Barnes & Nobles to help sell her 1st cookbook. She appreciated the few people who dropped by – myself included. Back in those days you could still find the boys and her working at the restaurant. I would absolutely hate to think that I would be judged by something I said or did in 1986 and so I will not do that to someone.